Many consider the transistor to be one of the most important inventions of all time. Though the precursors of the transistor were invented in 1907 (at the time they were not transistors yet, they were vacuum tubes called valves), these were soon replaced by smaller components called transistors. These are still the key components of modern computers nowadays. So what is a transistor? A transistor is an electronic component with three pins. Basically, a transistor is a switch (between two of the pins: the collector and the emitter) that is operated by having a small current in the third pin called the base. Use the checkboxes below this transistor to understand how applying a voltage to the base of a transistor is equivalent to turning on a switch. A transistor acts like a switch, operated by applying a small current to the base. Transistors are made by layering three types of materials: conductors, insulators and semiconductors. Logic Gates are made by combining transistors. 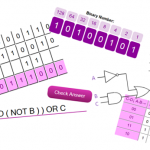 They enable to apply logic to small currents which are either turned on or off and represent binary information inside a computer. Computers are made by combining logic gates together. An integrated circuit (also referred to as a chip, or a microchip) is a set of electronic circuits on one small flat piece (or “chip”) of semiconductor material, normally silicon. The integration of large numbers of tiny transistors into a small chip results in circuits that are smaller, cheaper, and faster than those constructed of discrete electronic components. 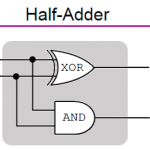 More complex integrated circuits include binary adders (half-adder, full adder used to perform binary additions) and flip-flop circuits used to implement volatile memory. A microprocessor is a computer processor which incorporates the functions of a computer’s central processing unit (CPU) on a single integrated circuit (or at most a few integrated circuits). The microprocessor is a multipurpose, clock driven, register based, digital-integrated circuit which accepts binary data as input, processes it according to instructions stored in its memory, and provides results as output. Back in the 1950s, computers consisted of vacuum tubes called valves (the precursors of transistors). These valves were quite bulky, like electric bulbs, and produced a lot of heat. The installations used to fuse frequently. Punch cards, paper tape, and magnetic tape were used as input and output devices. 1st Generation Computers were programmed using machine code. 1st Generation Computers were very expensive and only large organisations were able to afford them. In the early 1960s, 2nd Generation computers used transistors to replace the vacuum tubes of 1st generation computers. Therefore 2nd Generation computers were cheaper, consumed less power and were more compact in size. They were also more reliable and faster. More transistors could be used to create more complex computers. Magnetic tape and magnetic disks were used as secondary storage devices as well as punched tapes which were still used. 2nd Generation Computers were programmed using assembly language and high-level programming languages such as FORTRAN or COBOL. In the second half of the 1960s, integrated circuits were used by 3rd Generation Computers. An integrated circuit has many transistors, resistors, and capacitors along with the associated circuitry. 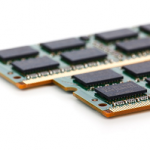 This development made computers smaller in size, more reliable and efficient. 3rd Generation Computers were programmed using High-level languages (FORTRAN, COBOL, PASCAL, BASIC, ALGOL-68 etc.). 4th and 5th Generation computers use micro-processor chips. In the 1970s, Computers of 4th generation used Very Large Scale Integrated (VLSI) circuits. VLSI circuits having about 5,000 transistors on a single chip called a micro-processor. Fourth generation computers became more powerful, compact, reliable, and affordable. They started the Personal Computer (PC) revolution. The period of fifth generation is 1980-to date. In the fifth generation, VLSI technology became ULSI (Ultra Large Scale Integration) technology, resulting in the production of microprocessor chips having ten million electronic components. The rate at which transistor counts have increased generally follows Moore’s law, which observed that the transistor count doubles approximately every two years. As of 2016, the largest transistor count in a commercially available single-chip processor was over 7.2 billion.